Daishoin Temple If you walk up from the mountain side exit of Itsukushima Shrine, in just a few minutes you will find lush green trees, a red bridge, a mountain stream with huge rocks and then a big gate. Daishoin Temple is at the foot of Mt. Misen. In contrast to the vermillion colored Itsukushima Shrine, this sedately colored temple exudes a serene atmosphere. After passing through the Niomon gate, you can take the steps in front of you, which will lead you to the main hall. 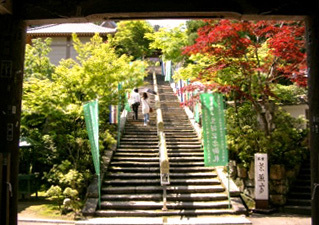 However, my recommendation is to veer left where you will find 500 Rakan (disciples of Buddha) lining the slope. These small statues all have different postures and facial expressions. 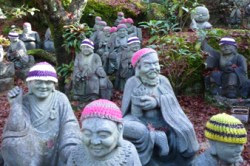 They also have knit caps to protect them from the cold. After taking off your shoes, you can come into the Kannon-do Hall and the Maniden-Hall. Admission is free. The image of the goddess of Mercy is believed to be over 1200 years old and the Fudo Myo-o in the Chokugan-do Hall was sculpted in the 16th century. 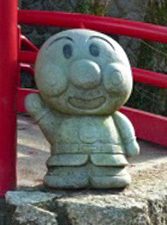 Along with these historic and religious images, there are also some rather funny ones like Kappa (an imaginary river creature), Anpan-man (a character from Japanese animation who offers his “red bean jam bread” face to be eaten), and Tanuki-so (raccoon dog monks) which illustrate the temple’s desire that everyone who comes should enjoy their visit here. There are other things to see and do in the precinct. For example, you can ring the temple bell (but just once please, for more than once means “fire!”) or if you’re thirsty you can get a herb tea. It’s free!